Next to falafel, stir-fries are a pure vegetarian staple. There is no easier, budget-friendlier way to incorporate a bit of healthy pure vegetarianism into your diet than whipping up a quick, tasty stir-fry with tofu once a week. Stir-fries are great, too because you can really get creative — from a pure veg twist on an authentic Asian dish, to simply using up everything you want to get rid of in your refrigerator — the sky’s the limit. 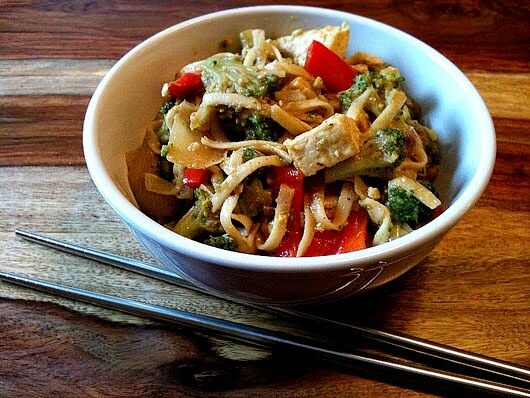 Below is the recipe for Curry Udon Noodle Stir-fry with Tofu, a variation from Veganomicon by Isa Chandra Moskowitz. This stir-fry includes an easy curry roux. If you want to get more authentic, you can find S & B Oriental curry powder at your Asian grocer, but any curry powder will work just fine — even generic, supermarket curry powder. For an easy added kick, throw in a touch of chili oil at the end! Prepare the tofu first. Open the package and remove the tofu, draining the water. Slice the tofu lengthwise into medium-thin strips and press to remove most of the moisture. If you don't own a tofu press, place each strip on a kitchen towel that has been folded in half. Lay another folded kitchen towel over the tofu strips and set a heavy pan on top. Let the tofu sit like this for 20 minutes, then unwrap and slice into smaller blocks. For an even firmer texture, you can now dry-fry your tofu blocks before adding them to the stir-fry by frying them in a dry, nonstick pan, pressing down with a spatula until both sides are golden brown and no moisture remains. Dry-frying removes all of the moitsure and helps the tofu to absorb the sauce better, and I love the texture of the tofu when I dry-fry it, but it’s not necessary in this recipe. Next, prepare the udon by cooking according to the package directions, about 5 minutes. You don’t want them to be too soft, otherwise they will break apart when stir-frying. Drain and rinse well with cold water. If you’re using fresh udon noodles, they require less cooking time than the dried udon that come packaged like spaghetti — about 3 to 4 minutes. In the meantime, prepare the curry roux sauce. Combine the flour and peanut oil in a small saucepan. Cook over medium-low heat, stirring constantly with a wooden spoon until the mixture browns to the color of rich caramel, about 10 minutes or less. Stir in curry powder and garam masala, and cook for another minute while stirring constantly. Switch to using a wire whisk and pour in the vegetable broth in a steady stream. Whisk in the agave nectar and cook the roux, stirring constantly, until a thick sauce forms, about 2 minutes. Remove from the heat and set aside. Now prepare the stir-fry. Heat the safflower oil in a wok or large nonstick skillet and cook the sliced onion until it is softened and translucent. Add the ginger, red bell pepper and tofu blocks, and stir-fry until the pepper starts to soften. Add the broccoli and stir-fry for 4 to 5 minutes, until it turns bright green. Return to the udon noodles — if they’re sticking together, rinse briefly and drain. Add the udon to the stir-fried veggies, sprinkle liberally with soy sauce, and stir-fry for 2 to 3 minutes. Be careful not to break the noodles — using two large spatulas or extra-large chopsticks like those that come with some wok kits might be helpful. Whisk another ¼ cup of vegetable broth into the curry roux sauce that you’ve left off to the side in the saucepan, until combined. Pour the sauce over the udon stir-fry and stir or toss to coat everything completely with the sauce. Stir or toss and cook until the sauce is simmering and the noodles are warm. Remove from the heat and serve. This sounds delicious, I can't wait to try it. Thanks, Brandi. It's one of my favorites, I'm sure you'll really like it!